Earn $10.87 in Rewards credit (1087 points) What's This? Tackle the pavé in complete confidence. 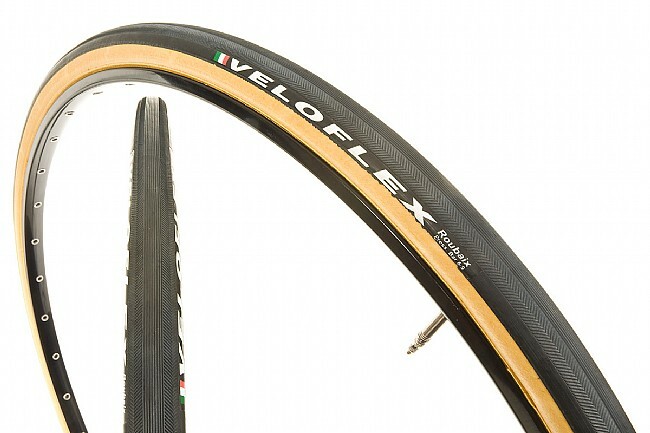 The Veloflex Roubaix is the ultimate tubular when racing on rough roads thanks to a wide 25mm contact patch and a blend of durable yet light materials. Unlike a typical skinny race tire, the Roubaix' extra air volume allows the tire to be run at lower pressures, soaking up vibration and actually reducing rolling resistance over uneven surfaces. An exclusive natural rubber compound provides reliable grip in wet or dry conditions, and a lightweight Calicot puncture resistant belt beneath the tread ensures reliability. Veloflex uses an outstanding 320 TPI corespun casing and latex inner tube to deliver an incredibly supple ride. The Veloflex Roubaix is available in 700c x 25mm (25-622 ISO) and features a 36mm Presta valve with a removable core. Recommended pressure: 85-130 PSI. Color: Black/Natural. Claimed weight: 290 grams. classic tubular tire, great history, great rolling, wearing and trusted tire on smooth and rough roads a like. living in the mountains of vermont these are go to tires. long may we ride. Tried these a few years back and fell in love. Just like the Criterium but a bit wider. They're a bit on the wide side for 25s (mounted on Firecrest 303s) and may not fit on older racing frames (Raleigh Team to be exact) but that extra bit of tire has saved my rims on multiple occasions. Strictly used for road racing and crits. Plenty of traction, long wearing, super supple. Very comfortable. I can bomb crap pavement in crits and have no fear of flatting or breaking a rim. Tires also seemed to be aged a few months and pre-stretched. They mount really straight too for a handmade tire. A they will not disappoint. Quality control seems a bit lacking. These are some of my favorite riding tires, unfortunately I have received some that had a fair amount of run out (high spots or low spots when you spin on a perfectly trued wheel). If the low or high spots are pronounced, I'll send them back. If the uneveness is spread throughout the tire, such that I won't feel a thump, thump, thump going down a smooth road, i will keep them. This is very disappointing on a premium tires like Veloflex. I ride a select set of tires, Gatorskin, Tufo, and now the Roubaix. It's kinda hard to find decent 25mm tires, but this tire is a clear choice over the others. Nice road feel, great handling, all the performance you expect in tubie, I just ordered another pair for back up.